In this quick article, we will discuss the usage and importance of SpringBootServletInitializer class in Spring boot. 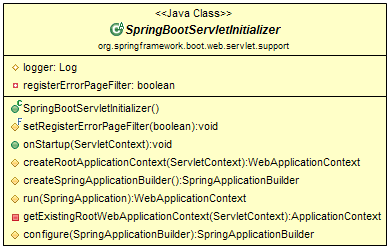 This SpringBootServletInitializer class belongs org.springframework.boot.web.servlet.support package. SpringBootServletInitializer class is an extension of WebApplicationInitializer which runs a SpringApplication from a traditional WAR archive deployed on a web container. This class binds Servlet, Filter and ServletContextInitializer beans from the application context to the server. Extending the SpringBootServletInitializer class also allows us to configure our application when it’s run by the servlet container, by overriding the configure() method. protected SpringApplicationBuilder configure(SpringApplicationBuilder builder) - Configure the application. protected SpringApplicationBuilder createSpringApplicationBuilder() - Returns the SpringApplicationBuilder that is used to configure and create the SpringApplication. protected WebApplicationContext run(SpringApplication application) - Called to run a fully configured SpringApplication. protected void setRegisterErrorPageFilter(boolean registerErrorPageFilter) - Set if the ErrorPageFilter should be registered. Once maven builds success then WAR file is generated under a target folder. Just copy war file to external tomcat webapps folder and start the tomcat server. If we want to package it as a JAR file, then we’ll need to add the same logic to the main() method so that the embedded container can pick it up as well. Note that a WebApplicationInitializer interface(SpringBootServletInitializer implementation) is only needed if you are building a war file and deploying it. If you prefer to run an embedded web server then you won't need this at all.